In Larry’s case, it truly has been a family affair. His dad and all of his uncles worked at Casco Bay Lines growing up during WWII. In 1960, Larry’s dad returned to moonlight as a Captain and he would bring his son with him. Larry quickly grew to love it. As soon as he was old enough, he followed in his dad’s footsteps. 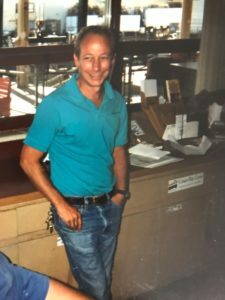 Larry has always loved getting to know our customers, generously sharing the rich history and his love for Casco Bay and the ferry line. While he’s captained them all, he would most look forward to bringing people to Bailey Island every summer when the weather warmed up and the days got longer. “I always enjoyed talking to these people from away who had never been out on the bay.” It’s a trip Larry’s dad also enjoyed back during the war. Somewhere along the way, Larry began collecting photos of the steamboats, reading everything he could get his hands on, making a point to talk to islanders and passengers older than him to soak up all of the history that he could. And, recently, he began making models of the old steamboats in his spare time. One such model now lives at Maine Maritime Museum and another at the Long Island Historical Society. And this week, after 44 years, Larry is retiring. To us, Larry, you will always be part of this family. And we hope you can’t stay away completely. Fair winds and following seas! From time to time on our blog we’ll be featuring stories of our fantastic crew to highlight their different roles, personalities, and connection to Casco Bay, our customers and our ferry line. If you have a particular staff member who you feel should be highlighted here, feel free to reach out to us!